Irish Angel Christmas Tree Ornament with Shamrocks, an Irish Blessing and a Horn. The blessing on this Irish ornament reads: With God All Things are Possible. 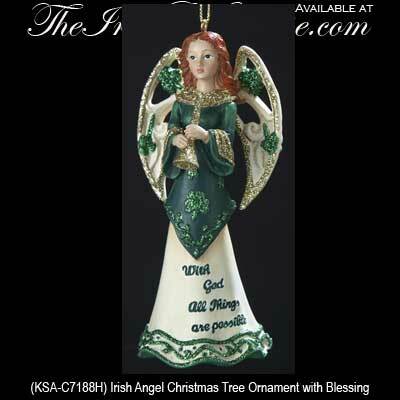 Irish Angel Christmas Tree Ornament with Shamrocks, Blessing and Horn. Features Green Glitter Shamrocks and Blessing and Red Hair. Dimensional Design, 4.5" Tall x 2" Wide, Made of Resin. Gift Boxed, Ready to Hang with Included Gold Cord.